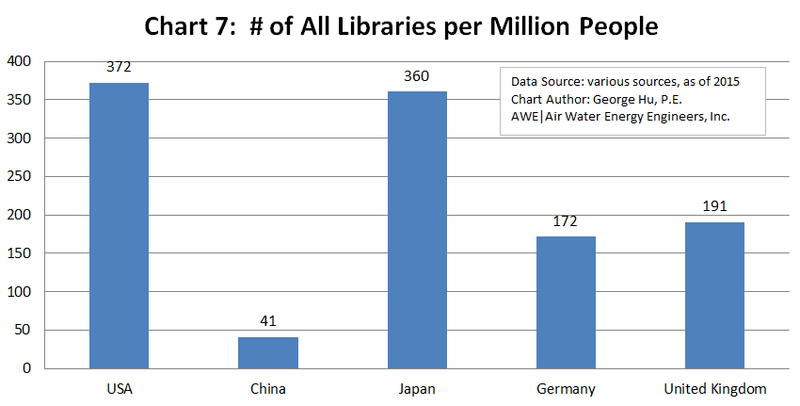 Number of Libraries vs. GDP of a Country « Air Water Energy Engineers, Inc. This summer I traveled to China with my family. It was a very impressive experience traveling on the high speed trains that run at 300 kilometers per hour (or 186 MPH), walking on the recently opened world’s longest and highest glass bridge in Hunan province, and taking the world’s fastest elevator to get on top of the world’s second tallest building, the Shanghai Center. All these marvelous achievements were brought about by the 30+ years of China’s fast economic growth. While in Beijing, I visited the Wangfujing Xinhua Bookstore on the Wangfujing Street that is very popular to the tourists. The bookstore was very busy as it always has been. The large number of tourists passing on the street, the bright and comfortable environment inside the building, and the fact that this bookstore is the largest branch among the Xinhua bookstore chain, probably all help to explain the large number of customers in the bookstore. 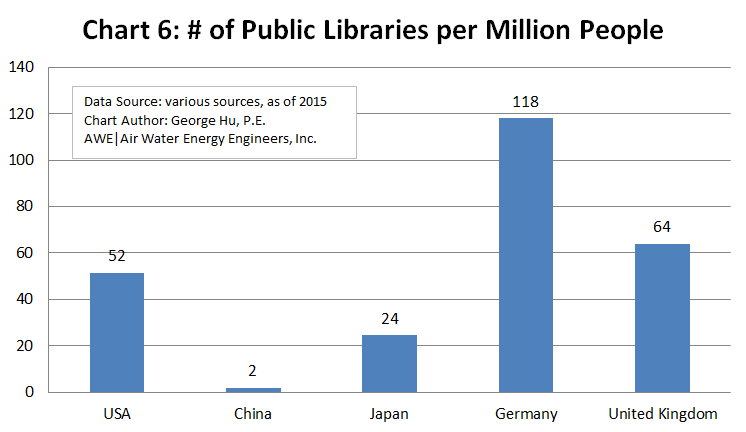 Having been the MEP engineer for some library projects in the U.S. in the recent years, something struck my mind suddenly, that is the severe lack of public libraries in China, despite the awesome economic development in the past 3 decades. The lack of public libraries in China perhaps helps to explain the crowdedness in the Wangfujing Xinhua Bookstore, maybe also other bookstores across the country. As a typical example for the lack of public libraries (or any type of libraries, for that matter), my own hometown Pingxiang, a city of 1.9 million people with 42 towns, has but only one public library, located in the city center, inconvenient for most of the people of the city to access. The gap between China’s tremendous economic growth and its library construction is enormous. As an immigrant who cares about both China and the U.S., I am prone to commit the sin of comparing the two. My curiosity also took me to look into the situations in other economically developed countries in the world. 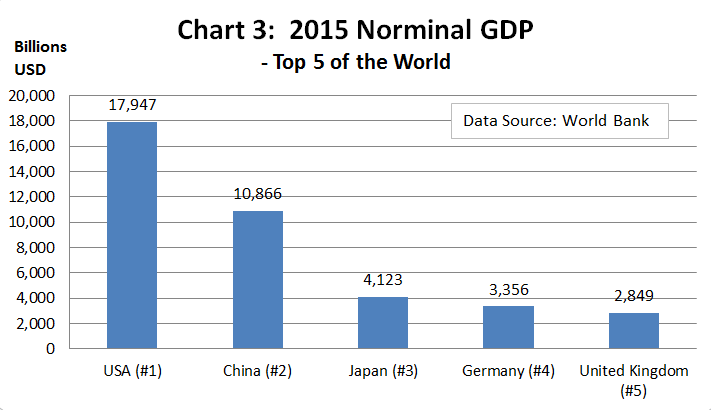 The following is a story-by-the-chart illustration comparing the 5 countries whose 2015 nominal GDP ranked the top 5 in the world: USA, China, Japan, Germany and the United Kingdom (these 5 countries accounted for 54% of 2015 world GDP), along with some of my thoughts and comments to share with you. 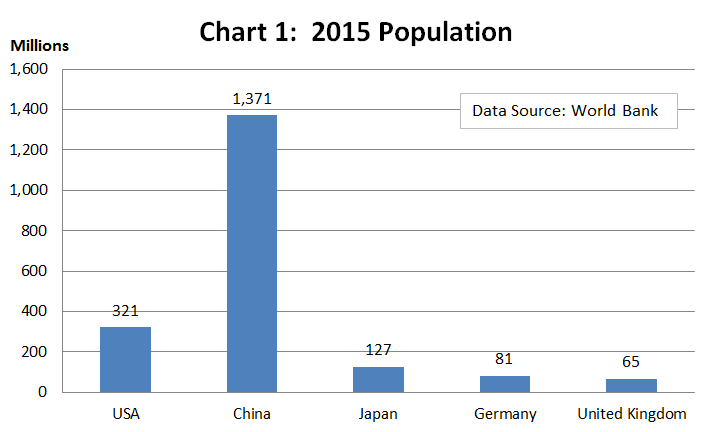 – From Charts 1 & 2 above, few people would feel surprised that the U.S. and China came as first and second for GDP. 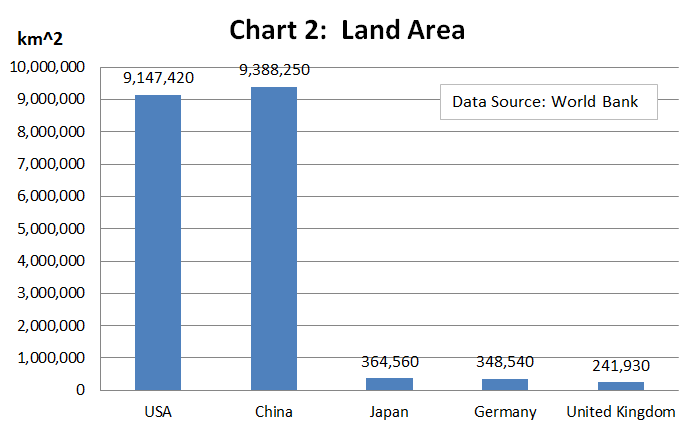 The sheer size based on population and land area explains it. – How about Japan, Germany and United Kingdom? They look tiny in comparison, especially in terms of land area. There are also many other countries “bigger” than them. But they made it into top 5 in GDP anyways? – Let’s look at something else – the number of libraries in these countries. 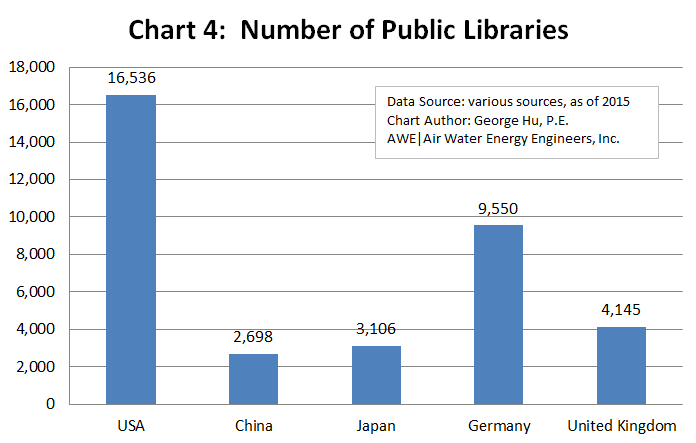 – China’s small number of public libraries (Chart 4) is just as amazing as its towering population figure (Chart 1) compared with the U.S.
– What explains the dramatic lack of public libraries for such a huge population in China? Will the situation change? What opportunities lie ahead? – What will be the dynamics between China’s economic power and its current severe lack of public libraries? – Adding the 53,000 “small libraries” or “reading rooms” to China’s All Libraries figure dressed up the chart (Chart 5) quite a bit. But the following charts tell a more real story. – I barely need to explain Charts 6, 7 & 8. When comparing public libraries or all libraries on per million people basis, China falls far behind the other 4 top GDP ranking countries. 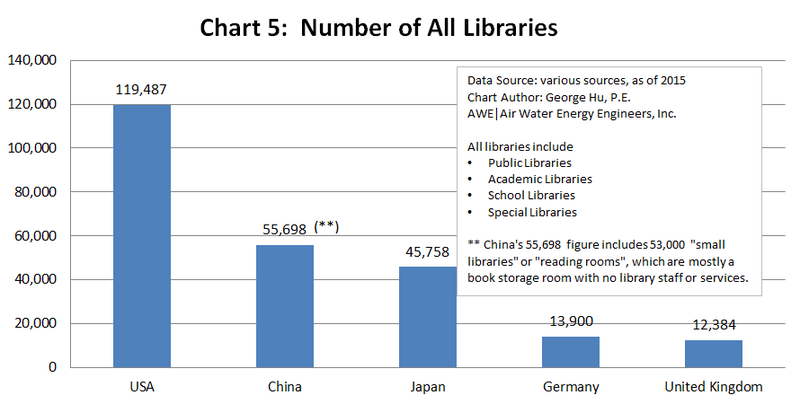 If we take the 53,000 “small libraries” or “reading rooms” out, Chart 7 would look even direr for China. – Japan, Germany and UK all stand out very impressively. Granted for my bias for libraries (public or other types), I am inclined to think that these charts explain why these 3 “tiny” countries made it to top 5 in world GDP ranking. Chart 8 says that they are not tiny – they are huge instead! 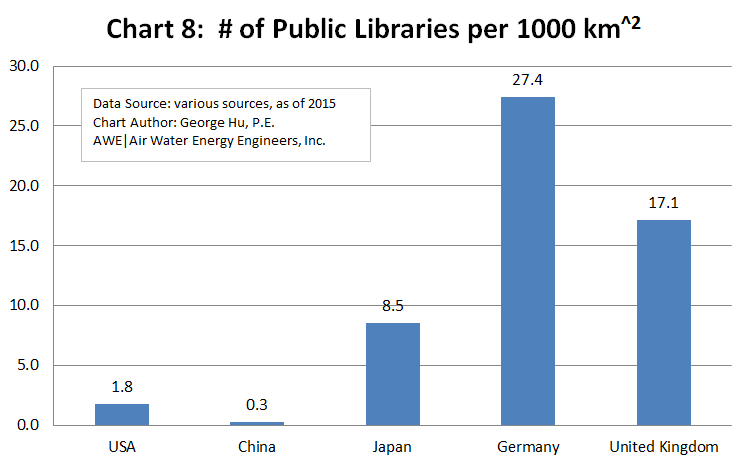 Japan’s All Libraries per Million People figure (Chart 7) comes almost the same as the U.S. Is it still a surprise that Japan ranked #3? – Chart 8 tells us, relatively speaking, how easy – to an extent – it is for ordinary people (not the elite, or the privileged few) in Japan, Germany and UK to access an environment of valuable knowledge, an environment conducive to learning, thinking, making, innovation and grow. I think here the word “environment” is the key. When I was researching on the internet for this article, I came across the news about UK’s closure of some public libraries in recent years due to the economic downturn. Given the correlation between the number of public libraries (or all libraries) and the performance of GDP among the top ranking countries, perhaps the decision to close a public library, in any country, should be more carefully considered and not to be rushed. In this regard, I am glad that the U.S. is doing rather well. Massachusetts, for instance, has the country’s oldest state library agency, MBLC, to maintain and strengthen the state’s 320+ free public libraries, and the agency is celebrating its 125th anniversary this year. The U.S. stands as the world’s most powerful country for a reason, I would like to think. AWE | Air Water Energy Engineers, Inc.